we’ve been in our new home about two months now and this has been our second move in two years. it’s truly been a whirlwind of a year and, even though i know we’ll be moving again in another year or two because we’re renting right now, the next house we buy WILL definitely be the last one for a very long time. we were lucky enough to sell our home in one month and it happened to be the month that the kids and i were visiting family in a different state so we didn’t have to worry about making sure the house was picture perfect because that’s the way we left it and andrew only had to clean up after himself before he left for work everyday. perhaps i’ll do a post later on about how we sold our house in just one month but for today let’s talk about moving with two kids under three. i knew it was likely going to be a stressful time but i tried to do as much as i could to make sure it wasn’t. 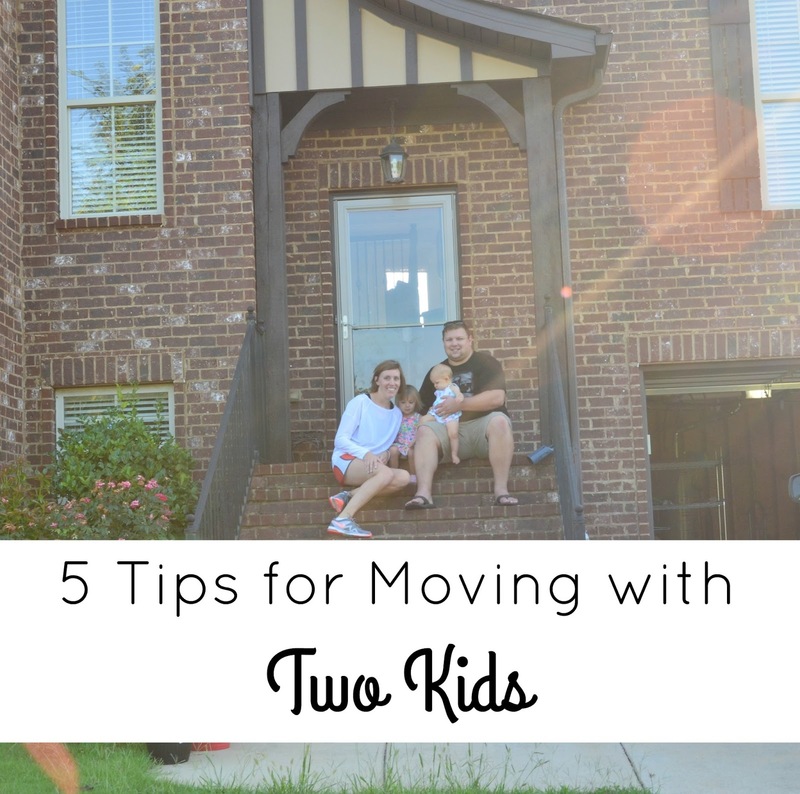 because i learned a lot throughout the experience, i thought i would share some knowledge on moving tips with kids i learned along the way in hope you can avoid additional stress in the moving process. talk about the new house. we talked so much about moving to the new house that by the time we were ready to move, addison was so excited to say goodbye to the old house and welcome the new house with open arms. she still refers to our house as the new house and we’ve lived here for a bit now. let the kids help you pack. when addison first saw the boxes being assembled, she was really confused why we were putting all her things in them and closing them up. eventually i started letting her help us. i told her she could pick out a few toys to play with until we move but everything else had to be put away so they could come with us to the new house. when she finally understood i wasn’t taking things away and they were only going to be away temporarily, she was very into packing everything up and helping me tape boxes. on the day of the move, try to take your kids somewhere else while things are being loaded up. addison goes to a mom’s day our program two days a week and the day of our move, the ladies there were kind enough to take amelia too while the movers came and loaded everything into the truck. it was nice to not have to worry about where the girls were or if they were getting into anything while movers were in and out of our house. contain the kids while moving boxes into the new house. i knew it was going to be craziness when we got to the new house with unpacking the truck. we ended up buying a portable play yard for amelia and i set it up in the living room right when we got there. i put her and a bunch of toys in there and she was able to entertain herself for quite a while plus i knew exactly where she was and that she was safe. addison on the other hand was very interested in helping move boxes into her room. buy a new toy for them. i’m not super into buying new things but this one just made sense. once we got to the new place before the movers showed up, each girl got a new toy i knew they would love. this kept their attention for longer than i expected because it was something different than what they already had. one of the big things that stressed me out was worrying that the kids were just going to be nut cases and scream their heads off the whole time but that wasn’t the case at all. i definitely think talking about the move and making sure addison was involved helped significantly with the transition. overall i know it could have gone a lot worse so i’m grateful that it was as smooth as it was. now i’m just praying it goes as easy next time! great tips! Definitely have someone watch the kids on moving day. We moved last year with a 3.5 and a 1.5 year old…twice! Having someone take the kids so I could pack and unpack a few days was super helpful too! These are such great tips! We did one move when my dude was 2 years old, and we had him babysat the day of and I was able to set up his entire room the same day. It helped with the transition. Gosh I can't even imagine moving with kids! I'll definitly have to keep your excellent tips in mind if we move while the kiddos are little! I wish I would have read this 6 months ago during our move! Excellent tips!! These are really great tips!! Moving with little kids is can be a lot of fun, but it is super stressful!! I love these tips! It's so hard but fun to move with littles! These are such good ideas!! We plan on moving some day in the next couple years so this is so helpful! While you leave out toys that the kids cannot do without, it seems like everything was a must-have object for our son. My wife ended up labeling the boxes of his toys in excruciating detail so when we arrived at the new house, we could find certain toys that he had to have right away without opening every box the first night.